Froala is a clean and simple jQuery HTML5 coded WYSIWYG rich text editor. Froala supports auto-save, inline mode, spell check, ajax requests, image callback and many more.The plugin is retina ready.You can edit either one paragraph or thousands of web pages and you don’t have to worry about losing the data because Froala will autosave all the progress. And one more thing.It has a great image support that works on tablets and smartphones. 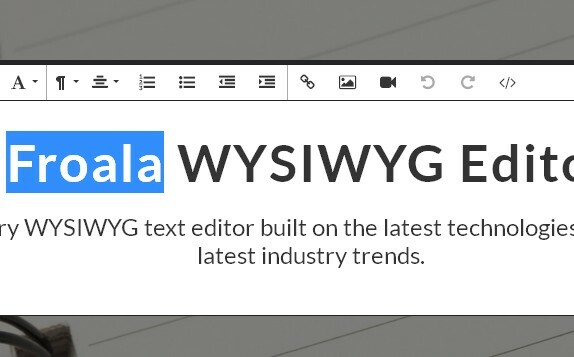 WYSIWYG text editor is available under a dual licensing model. You can benefit of the free HTML editor for personal and non-commercial project under the Creative Commons Attribution-NonCommercial-NoDerivatives 4.0 International License. For commercial web pages, three paid licenses are available, depending on the desired usage requirements.